Dignity Health - St. Rose Dominican exists to meet the health and wellness needs of all of those in our community. Health is more than not being sick - it is well-being in mind, body and spirit. For many of our employees, St. Rose Dominican is more than a place to work. Many individuals choose to support St. Rose Dominican because they believe in our mission and the value of our work together. Employees have the opportunity to donate throughout the year to the annual iGive Campaign which kick offs annually in Decemeber. Funds are raised for the various philanthropic projects at the three St. Rose Dominican campuses and Community Outreach Department. Gifts to the employee campaign directly impact the quality of care that our patients receive. Patient care services, health education, community outreach and vital equipment purchases have all been made possible through the support of our St. Rose Dominican employees. One hundred percent of the employee's donations go to the area of greatest need or to the area or program they designate. 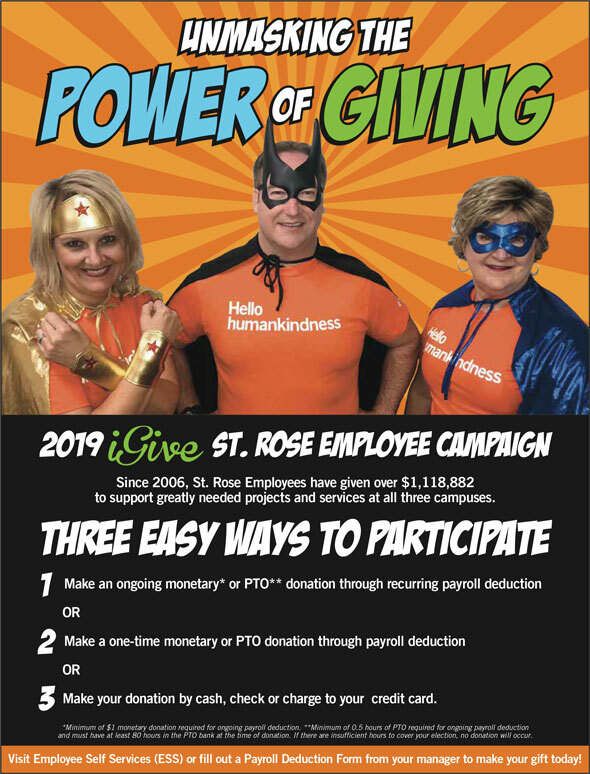 Employee donations can be given in the form of a one-time gift or a pledge and can be made in cash or through easy payroll deductions. *Minimum of $1 monetary donation required for ongoing payroll deduction. **Minimum of 0.5 hours of PTO required for ongoing payroll deduction and must have at least 80 hours in your PTO bank at the time of donation. Complete the donation form and send via interoffice mail to the Health Foundation. Go to Employee Self Service. If you have any questions about specific details of the annual Employee Giving Campaign, please call the Foundation office at 702.616.5750. Thank you for your continued support and generous gifts!